wow, this is a fantastic idea! i can't even imagine the amount of time this would take me. i'm not sure if i would do it though, because i can be quite messy and i'd probably end up smearing some shades together :p. but i think i'm still intrigued enough to try it out with a few shades. Amazing idea - and really compact too! Are the lipsticks in eyeshadow pans from the Claire's case in the other post? They slot together so neatly! I'm thinking of doing this for my mom - was looking through her lipsticks the other day - and she has so many tubes with so little product - yet she doesn't want to throw them away. @Dani Thanks :) You should try it, it just needs some patience. @Ella Pretty - Yes they were eyeshadow pans :) It's a good idea to do that for your mum, she will love it. Aw this is so cute! Some of those lip colours look amazing. This is such a good idea...Must have taken you ages, but so worth it! Next step - Make a palette with a whole look in it...concealor, shadow and lips...!! that is an amazing idea, I think I will try this myself! would be good for taking make up to a job! thats such a great idea! i definitely need a more travel friendly way to store my lipsticks :) thank you! omg that is sooo amazing!!!! omg!! (i read ur other post and woow!!) so thats how lipstick palettes are made!!! i might try that in the near future!! Very good idea. But you have to be brave and travel with a lip brush. 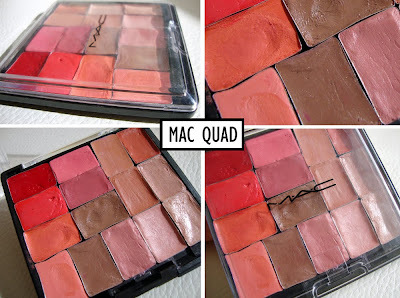 I don´t know if i could do this to my mac lipsticks but maybe with the rimmel ones. @Glitterish Allsorts - I only melted 1/4 of a lipstick. This, and your other diy lip palette, is GENIOUS!! this is such a creative idea! Love it! Wow wow wow! Just genius! Any idea how long the original palette took to make?